Hurricane Harvey battered Deven Bhakta’s Port Aransas hotel until it was uninhabitable. The Austin American-Statesman reports the Category 4 hurricane’s 130 mph winds blew out windows and stripped parts of the roof off the three-story Holiday Inn Express, while the resulting storm surge filled the hotel with nearly 2 feet of water. The 74-unit building, which Bhakta owns, has since been completely gutted and won’t reopen until January. “By the time we took out all the damaged items, all we . basically had left was studs,” Bhakta said. 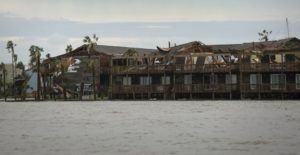 It’s been 10 months since Harvey ravaged the Texas coast with roaring winds and record rainfall, around half of Port Aransas’ 3,900 lodging units are still out of commission. The shortage has led to a decline in occupancy and sales tax collections, though an influx of day-trippers has helped keep the island town’s economy afloat. The rental stock in Port Aransas, about 170 miles southeast of Austin, consists of hotels and motels, condos and vacation homes. Jeff Hentz, president and CEO of the Port Aransas Chamber of Commerce & Tourism Bureau, said he expects most vacation homes to reopen this summer, with most hotels to follow suit by the fall. Most condos, however, won’t be repaired and back open until next year, he said. “Having 50 percent of the lodging not available during peak season is a huge gut punch to us. We thought up until March . we would have 75 percent back to 80 by summer,” Hentz said. Delays in insurance settlements and a shortage of available contractors has slowed the rebuilding process, he added. The coastal community of 4,000 draws around 5 million visitors per year. In fiscal year 2017, which ended in September, the city of Port Aransas collected more than $4.8 million in occupancy taxes from short-term rentals. As of May, eight months into the new fiscal year, Port Aransas had earned just $780,000 in occupancy taxes – 58 percent less than the town received by the same time last year. Port Aransas City Manager David Parsons said occupancy tax revenue is typically used to maintain city facilities and beaches. The city is leaning on reserve funds while it waits for its lodging capacity to replenish, he said. Meanwhile, most town businesses – around 85 percent of restaurants and more than 60 percent of shops – have reopened for the summer season. The city’s sales tax revenue has steadied in recent months, down just 11 percent through April. Sales tax income in March exceeded last year’s number by more than 4 percent. Parsons credits the return of businesses and “massive” crowds of day-trippers for the sales tax revenue recovery. Texas SandFest, the nation’s largest native-sand sand sculpture competition, brought a record number of visitors to the town in April. “They may come and stay in Corpus, but they want to spend the day on Port A beaches,” Parsons said. Reconstruction has also played a role in the sales tax boost, he said, as contractors are buying goods and dining out. Still, some restaurants have noticed a dip in sales due to the lodging shortage. Chris Collins, general manager of MacDaddy’s Family Kitchen, said sales have dropped 15 percent below normal levels since the restaurant reopened in February following nearly $650,000 in repairs. Despite strong weekend and holiday sales, Collins said business has struggled during weekdays. The lunch rush at MacDaddy’s was quiet on a recent Wednesday afternoon, with customers occupying just a handful of the restaurant’s 31 tables. “Then dinners are pretty slow because, once again, there’s no place to stay,” he said. The Back Porch Bar, a waterfront establishment just a half mile north of MacDaddy’s, has also seen fewer evening customers. Owner Glenn Martin estimates his bar is drawing 60 percent of its typical summertime crowd. “We have big name bands on Friday and Saturday night, and people are just not going to want to hang out to go to a concert and then have to drive back to Corpus or somewhere else,” Martin said. The current shortage notwithstanding, Hentz said there is cause for optimism. At least 70 percent of the town’s rentals should be operational by the end of the year, he said, and the rest should reopen by next summer. Plus, Hentz said there are thousands of new lodging units planned or slated for development in Port Aransas. By 2024, he said the island town may double its short-term rental stock. “The future is bright in the long term, but in the short term we’re going to be fighting a little bit,” he said.